4000 Rivets : ONE YEAR! We have been traveling, touring, exploring and living in an Airstream officially for one year now! We began this adventure long before that, of course, with conversations that usually began with the words "what if we", or something along that vein...! What if we retired a little earlier...what if we downsized into a smaller home now that the kids are grown and we've stopped loving the yard work! What if we traveled for awhile before we bought another home and another lawnmower! What if we traveled in an Airstream! Thus began the journey, with Gracie, whom we purchased from Airstream Adventures NW in Caldwell, Idaho. Gracie is a 27 foot front bedroom International Signature...and we loved the look, the space and the size was perfect for first time towers! We sent Gracie off to Wilsonville, Oregon to have her customized by the great people at Ultimate Airstreams. The Grand Lounge Gourmet conversion offered us a more livable dining and seating arrangement and a wonderful butcher block counter with tons of storage! Once she was back in our home town we began the move in process, while staging our home and putting it up for sale...we sold our beloved Sportsmobile (campervan on steroids) and, Mike retired, from a job he really loved! In early May of 2017, we took Gracie on a couple of shake down trips, one to Lava Hot Springs, just south of Pocatello and then to our favorite National Park, the Grand Tetons! We had lived within easy reach of Jackson, Wyoming and the glorious Tetons for years and the Park had become our weekend getaway nearly every weekend, for photos, wildlife sightings, hikes, kayaking and camping. It was wild to 'camp' in such a luxurious way, but I took to the idea of glamping quite quickly! On Memorial Day weekend 2017, we packed up Gracie with everything we imagined we might need (and some things we clearly did not need!) and we headed out, to begin our full time venture! One year to the day we found ourselves moochdocking in the same wonderful spot with family in SE Washington! In one year, we may not have adventured as far as some, in miles, but I imagine we have had as many adventures as most! We figure-eighted in and around Idaho, Montana, Wyoming, Washington, Oregon, California, Arizona and Utah...stayed in RV parks, campgrounds, Walmarts, national parks, alleyways (:-)), Harvest Hosts and boondocking sites! We got to spend quality time with our kids often, welcomed a new grandchild and got to spend time camping with the other FOUR! We met lots of new friends and connected with others! We hiked more, explored more, laughed more, played way more, ate more (:-)), saw more amazing sunsets and lived more! Ten months into our travels we also purchased more! While in Scottsdale, Arizona, enjoying the sunshine and warmth of an Arizona winter, we toured the new Airstream dealership in town...and fell in love with the 30 foot version of Gracie! Gracie Lou, as she came to be called, has a bigger living and dining area, a bigger bathroom and two additional closets in the bedroom - enough said! 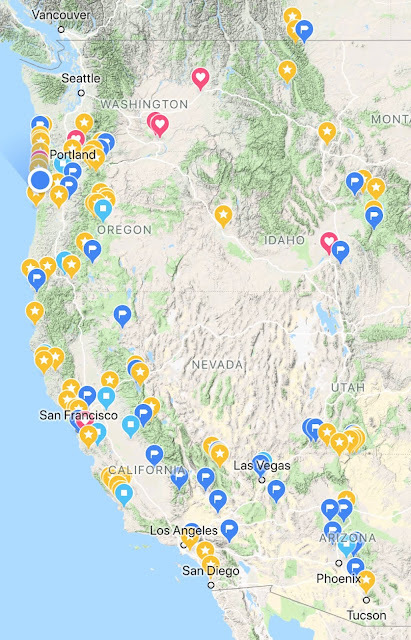 We made the trade while hanging out in their alleyway overnight...and Gracie Lou has been an amazing space to continue mapping our way across the western states! I've mapped our travels with my Google Maps app on my phone...tagging various locations as campgrounds, boondocking, Harvest Hosts or RV parks...and added stars for places we've explored! It's not as thorough as the notes we've kept, but it is a nice visual of where we have been...and a nice reminder of places we intend to return! We got to take our whole family to Disneyland this past Fall! That experience will be hard to beat, but not because it's Disneyland, because the consensus is that we could've skipped the park and just hung out together and it would've been nearly just as wonderful! A couple of months later, we got to be there when Judah, our 5th grandchild was born! Without exception, that's the most amazing part of our last year. We also got to spend time with all of Mike's siblings and his parents, my brother and my cousin! We do love our family. ...that's where we are at right now, in fact...enjoying some sticks and bricks living in our time share (including bathtubs!) while Gracie Lou is getting a great solar install! After one year, we find ourselves asking, "what if we do this, well, until we can't..."